Because I look after children, I often find myself saying "Don't worry about what they're doing, you just worry about you." Usually, this is because Child A is concerned because Child B is doing something they're not supposed to do, never mind that Child A was just disobeying that same rule a moment ago. Or maybe it's because I just asked the kids to do something and one didn't do it immediately, so another quickly points that out, which of course means that they're not doing what I asked either. Even as adults, though, we tend to focus on other people and whether or not they are doing what is expected of them. Sometimes we are so focused on what other people are doing, compared to what we think they should be doing, that we forget that we should be paying much closer attention to what we are supposed to be doing. There are also times when we are very concerned that other people are being asked to do things that are comparable to what we've been asked to do, not necessarily because we want them to be doing the same things, but because we want the work load or expectations to be spread out fairly. I see this in my own kids sometimes, when I ask them to set the table or some other chore and they ask if they should call out to their brothers to get them to come help too. After Jesus rose from the dead, He spoke with Peter about the future. Jesus said to him, "'Very truly I tell you, when you were younger you dressed yourself and went where you wanted; but when you are old you will stretch out your hands, and someone else will dress you and lead you where you do not want to go.' Jesus said this to indicate the kind of death by which Peter would glorify God. Then he said to him, 'Follow me!'" (John 21:18,19). So, Peter is being given a glimpse of something hard that he will have to deal with in the future. What does he immediately do? 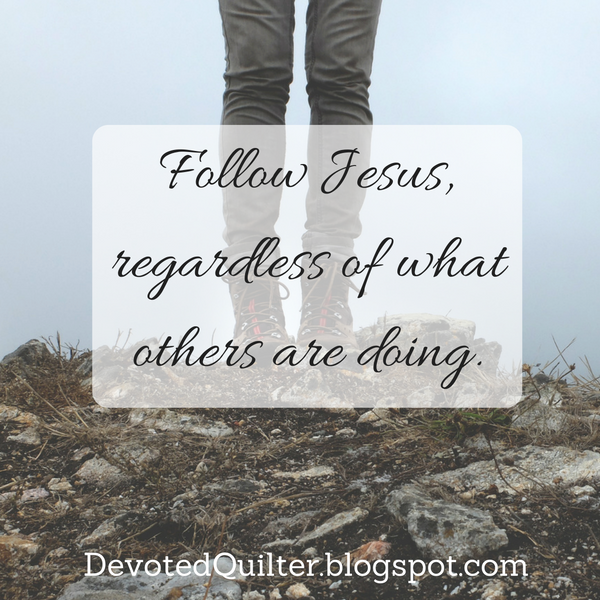 "Peter turned and saw that the disciple whom Jesus loved was following them...When Peter saw him, he asked, 'Lord, what about him?'" (v. 20,21). Interesting, isn't it? Immediately after being told something that he will deal with in the future, Peter turned, looked at someone else, and asked, "Well, what will he be asked to deal with?" It's almost like you can see the balance scales in Peter's mind, making sure the demands on him wouldn't be more than the demands on someone else. And Jesus' response? "'If I want him to remain alive until I return, what is that to you? You must follow me'" (v. 22). Essentially, He said, "Don't worry about him. You just worry about you." When things are going wrong in our lives, we sometimes look at other people who seem to have everything going their way and we ask, "Why aren't they dealing with anything like this? Why is everything so perfect for them?" The answer is...don't worry about them. We don't know what God has asked them to deal with in the past, or what they're dealing with now, or what God will ask them to deal with in the future. I love that Jesus asked Peter, "What is that to you?" What concern is it of ours what God wills for another person? I certainly don't mean that we should ignore other people and the problems they may be facing, but we can't concern ourselves with it in the context of keeping score. I also like that Jesus told Peter, "You must follow me." Really, that's all any of us need to worry about. Are we following Him as best we can, regardless of what others are doing? Don't worry about what anyone else is called to do. You just worry about you. I shared my favourites of my first 14 designs here, so now I'll share some of my favourite designs from the second half. This one came about after Nathan was following video instructions to draw a robot made of squares while I was washing dishes. 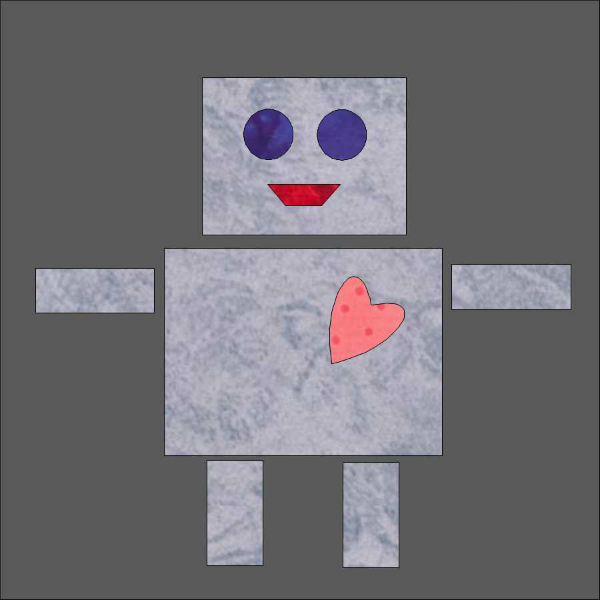 It sounded fun, so when the dishes were done, I sat at my computer and used basic shapes to create my own robot. I think he'd be a cute first-applique project for a child, or he'd make a cute baby quilt. I really love this design. I'm not sure what I like best, those tiny little churn dashes or the asymmetrical layout. Regardless, this one is definitely in my plans for someday. I'm calling this one Refract. I had fun creating this unusual layout with just two blocks. This design was inspired by a QDAD prompt. I'm not quite sure it would be possible to assemble it exactly as I've drawn it, but I might just have to figure it out one of these days. The challenge was a lot of fun, and designing so often really helped the get the ideas flowing. It was also great to see the incredible designs others were sharing at #30DaysofQuiltDesignChallenge. Now to get some of these designs made into quilts! 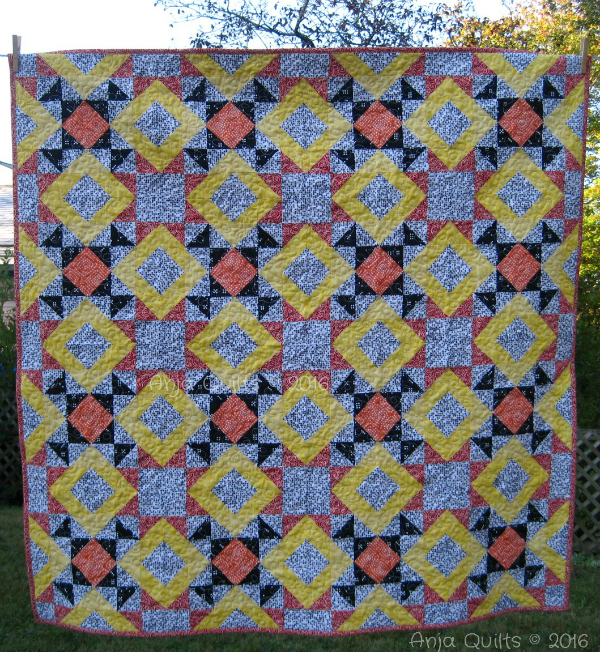 I have been quilting for almost 20 years. Most of that time I've been quilting by myself, with maybe one acquaintance who also quilted. 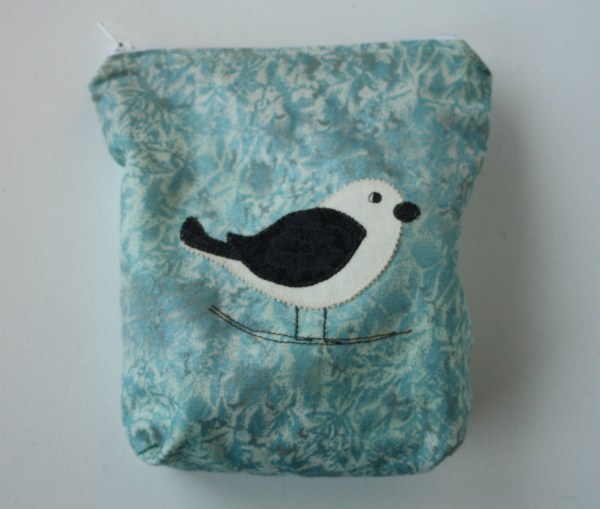 Other times I've known a couple of people who wanted to learn, so I taught them and we sewed together for a while. 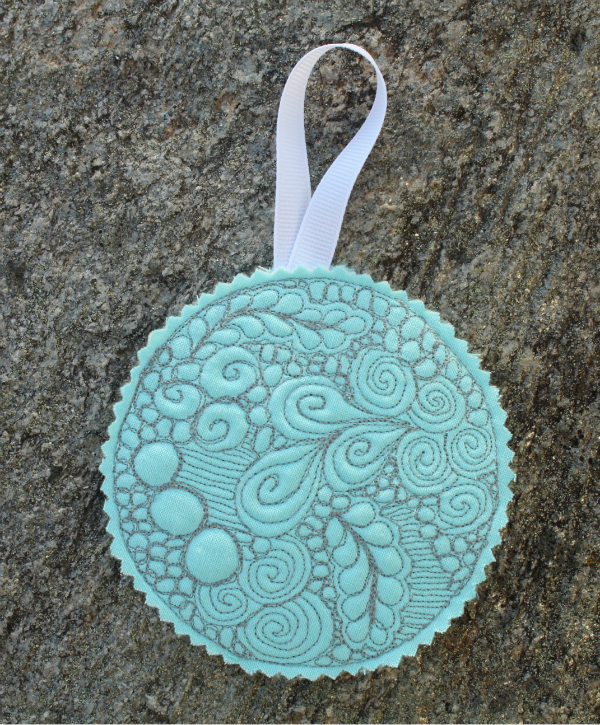 Then I started my blog and suddenly I had an abundance of sewing friends all over the world. They were sharing amazing pictures of the things they were working on, which made me want to try new techniques, new colour combinations, new patterns and new fabrics. I was already passionate about quilting, but the more exposure I had to what other quilters were doing, the more my love of quilting grew. It has been great to expand to Instagram and join in with events like the Friday Night Sew Along, or Saturday Night Craft a Long, or the 30 Day Quilt Design Challenge. It's so wonderful to be working on something at the same time other people are working on their own projects, even if we're only sharing our progress as pictures on our phones. The connection is still there as we comment on each other's work and cheer each other on. When I read Romans 1 a few weeks ago, I was struck by this, "I long to see you so that I may impart to you some spiritual gift to make you strong— that is, that you and I may be mutually encouraged by each other’s faith" (Romans 1:11,12). Paul was writing to the Christians in Rome, telling them that he hoped to soon be able to come visit them, in part so he could teach them something that would make their faith stronger, but also so they could mutually encourage each other. Just like quilters! I wonder how often anyone has ever said the apostle Paul is just like a quilter? But it's true. Just as I love sewing with friends (online or in person), Paul liked to spend time with other Christians because he found the time together to be encouraging to his faith. You may wonder how this is true, since Paul was the teacher and founder of churches. He already had such a firm grasp on faith and the importance of the gospel. How could the average person encourage him and increase his faith? Well, a couple of times recently I have heard or read of quilting teachers saying that they love teaching workshops to guilds or other groups because there's so much love for quilting in those sessions. They said they love the energy of the quilters sharing their love for this craft. They love how the (mostly) women share their favourite colour combinations, or share little tips and tricks that make the work faster or easier. Even though they are the teachers for that session, their own love of quilting is built up because of the time spent with other quilters. Those teachers know so much about quilting, and in some cases they know much more than the people they're teaching. But it's not always a matter of who has the most knowledge or experience. Enthusiasm is contagious, so the more enthusiastic a quilter is, the more enthusiastic others around them can become. And you don't have to be an experienced quilter to be combining colours in new and interesting ways, so your eye for colour can awaken a more experienced quilter to a combination they've never considered before. The same is true in our spiritual lives. Enthusiasm is contagious, and sometimes it's the older, more experienced Christians who need to spend time with newer Christians to catch sight of that enthusiasm again. We all see the world differently too, which means that we all see our faith differently. Most people probably don't associate their faith with quilting, but my mind often puts the two together. I also see a lot of connections between the bible and looking after small children, probably because I've spent the past 14 years in the company of toddlers and preschoolers. You likely make other connections when you read certain passages of Scripture, based on your interests and experiences. That's why being around other Christians is so important. The writer of the book of Hebrews wrote, "And let us consider how we may spur one another on toward love and good deeds, not giving up meeting together, as some are in the habit of doing, but encouraging one another—and all the more as you see the Day approaching" (Hebrews 10:24,25). Of course, sometimes 'meeting together' happens in person and sometimes it happens online or through books. There are several devotions I enjoy reading, including (in)courage and Our Daily Bread. I also enjoy books by Charles Swindoll, Mark Buchanan, Ravi Zacharias, Philip Yancey and many others. All of them have experienced life differently than I have and so they have different insights to share. And if you feel you don't have much to offer to encourage others? I don't think that's the case at all! I know that several of you have encouraged me through your comments left here on these devotions, sharing your own stories about how faith has helped you through tough times. 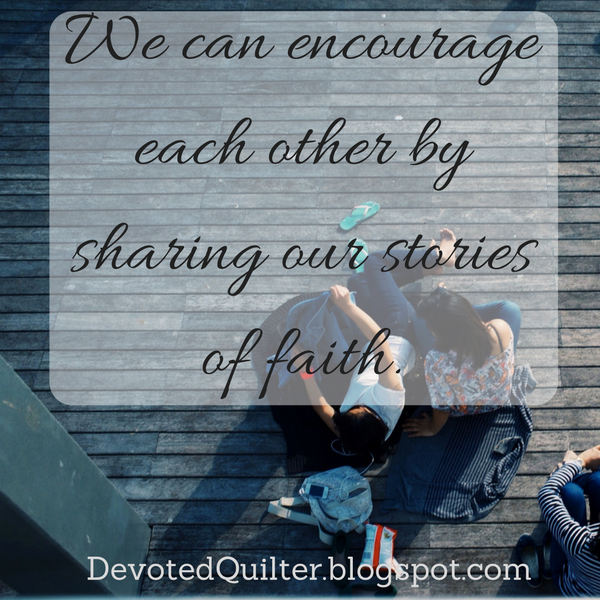 We can encourage each other simply by sharing our stories of faith. Renee of Quilts of a Feather and I agreed to swap mini mini quilts a few weeks ago. This is the gorgeous mini mini that Renee sent to me. 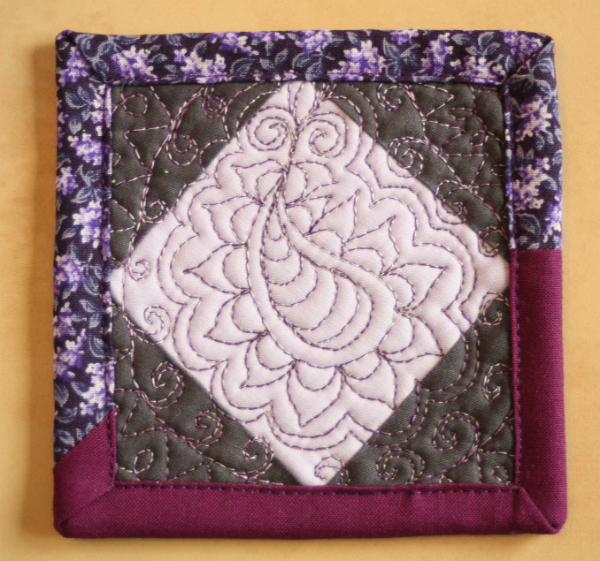 I love the two toned binding, and of course the quilted paisley (one of Renee's trademark designs) is perfect. 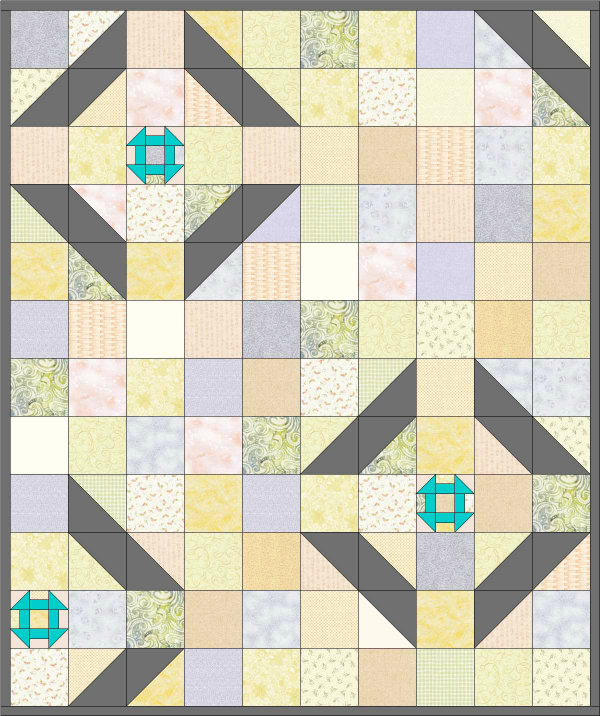 So, when I was trying to decide what to make for her mini mini, I thought of the Lone Star block, but there was no way I was going to attempt a whole block at such a tiny scale! Even half of a Lone Star seemed like too much, so I decided to try just 1/4 of a Lone Star, using Renee's favourite colours - grey and teal. 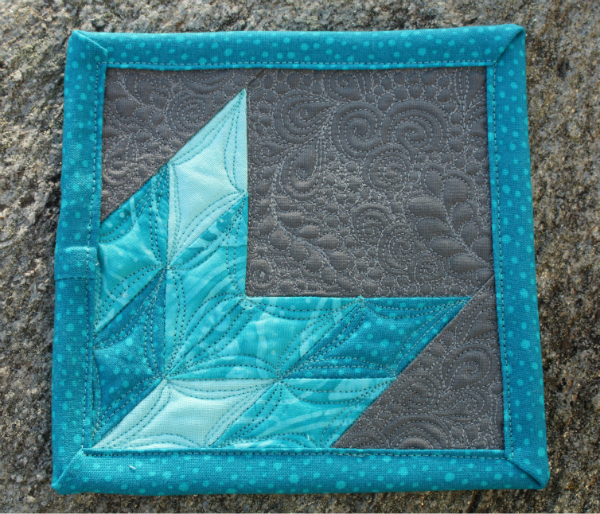 Normally the star pieces are arranged in layers, so the darkest of my teal fabrics would have both been on the outside edge of the star and the lightest both in the center, or the other way around. Either way, though, I found it looked kind of flat somehow. Once I turned one of the sections around so that they alternated I liked it much better. Once that was pieced, it was time for my favourite part - the quilting! 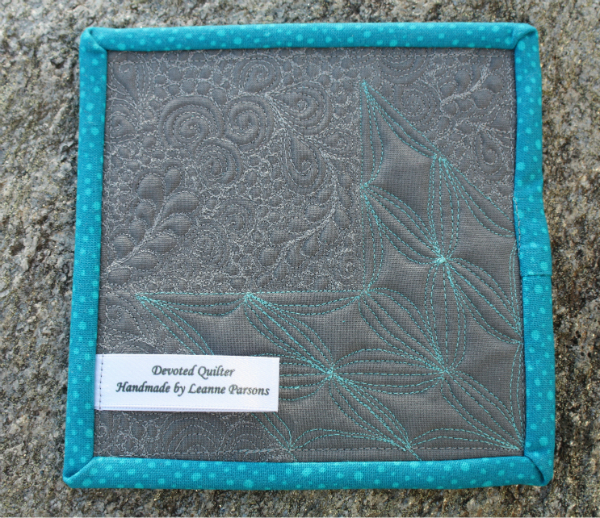 I chose to do teeny-tiny flow quilting in the background and a dot-to-dot design in the star. 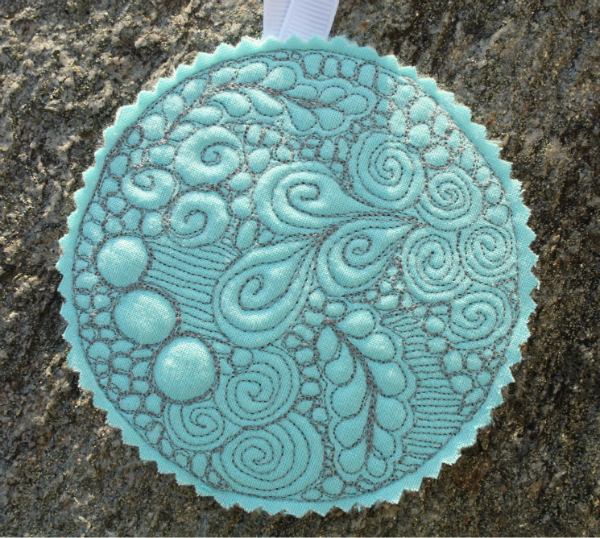 Then I decided to make a Christmas ornament to send with her mini mini. It's an idea I've been wanting to try, so I grabbed some of the fabric left over from making my Porthole quilt block and some grey thread and went for it. And I love how it turned out! For now, I'm going to spend the rest of the evening working on my Just the Basics quilt. One of these days I'll get the quilting finished! I have really been enjoying the beautiful weather we've been having this fall, especially because it allows me to take the kids I babysit for a walk pretty much every morning. The more days we get out for a walk, the more sane I stay :) Right now I look after three kids, two 1 year olds who ride in a double stroller and an-almost three year old named Fiona who walks holding onto the stroller. I've looked after quite a few kids and Fiona seems to enjoy walking the most out of all of them (besides the ones in the stroller, who always love being out). Our normal walk takes close to an hour because we can only go at her pace, of course. But one morning she was singing as we were coming up to where I would normally turn to head back home, so I knew she was enjoying the walk, and it was such a beautiful morning I didn't want to go home, so we just kept on going. The extended route took 1 hour and 20 minutes, and she never once complained. Just before we got back in sight of the house, she did say, "I'm getting tired," which struck me as funny, because I was getting tired and she takes two steps to every one of mine! There are a couple of places where we go down fairly steep hills and I have to be very careful about where Fiona is walking. Most of the roads in our small town don't have sidewalks, so we are walking on the road itself and there's a mix of sand and tiny pebbles on top of the pavement in places. If we're going down a steep hill we have to walk a step or two farther into the road (there really isn't much traffic, so this is perfectly safe) so that Fiona's feet aren't landing on that mix of sand and pebbles. Unfortunately, I discovered this because one day she did step on the loose pebbles and she skidded down and hurt her knee a bit. Those pebbles don't look like much, but they are just enough to keep her little foot from making contact with the solid pavement. 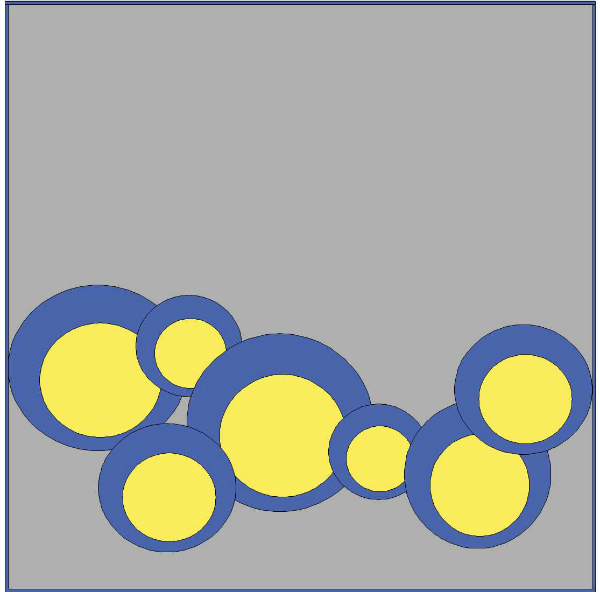 Then, when her weight shifts as she walks, the pebbles roll under her foot and she loses her footing. Jesus had this to say about the difference between being on rock and being on sand: "Therefore everyone who hears these words of mine and puts them into practice is like a wise man who built his house on the rock. The rain came down, the streams rose, and the winds blew and beat against that house; yet it did not fall, because it had its foundation on the rock. But everyone who hears these words of mine and does not put them into practice is like a foolish man who built his house on sand. The rain came down, the streams rose, and the winds blew and beat against that house, and it fell with a great crash" (Matthew 7:24-27). A house built on sand is not stable, it's going to fall as soon as a storm comes and pushes against the sand. But a house built on rock is not so easily moved. The same is true of our lives. Building our lives by following the teachings of Jesus requires moment by moment, decision by decision connection with Him. Of course, we also often compare our lives to a journey, and so you can think of each of those moments, and each of those decisions, as another step on the road. The important question is, are we stepping on the solid pavement, or are we stepping on the loose rock? The more we are connected to God, stepping on the solid pavement, so to speak, the less likely we are to slip and fall. We stay connected in any relationship by spending time with the other person, right? Well, it's the same spiritually speaking. We stay connected to God by spending time with Him, through bible reading and prayer. There are times, though, when little pebbles get in the way and reduce our connection to Him. I'm not talking about sin, but about the things that keep us from having a firm spiritual footing, which then makes us more prone to slipping into sin. What are these little things, you ask? Well, I can think of two. First up is our constant state of busy. We are all trying to do so much, but there are only so many hours in a day and there's really no way to fit it all in. What falls off the schedule when there's not enough time for everything? Prayer and bible reading. At least, that's what happens for me. So all those things we have going on in our lives can act like little pebbles, getting in between us and God. The second thing is our choices. You see, there are a lot of times when I tell myself that I don't have time to read my bible, but really it's that I'm choosing to spend my time doing other things. Do you see the difference? There are some things we have to do that are non-negotiable. Work and caring for our families are things that have to happen. But there are plenty of hours in a week that we fill with things we choose to do. Hobbies (reading and sewing are my biggest ones), TV watching, social media...these are things we choose to do. I have to admit that I'm quite prone to choosing other things over time in prayer or reading my bible. On their own, the things we have to do and the things we want to do are not necessarily bad for us. They don't necessarily hurt our relationship with God or make us more likely to sin. It's when the pebbles accumulate to the point that we're no longer making sufficient contact with the solid pavement that our feet slip, and it's when we're no longer making sufficient contact with God that we slip spiritually. Fortunately, the fix is simple. When I'm walking with the kids, I keep an eye on the ground ahead of Fiona's feet so that I can keep her feet on the solid pavement. Spiritually speaking, we need to keep our own feet on solid pavement by not allowing other things to keep us from spending time with God. 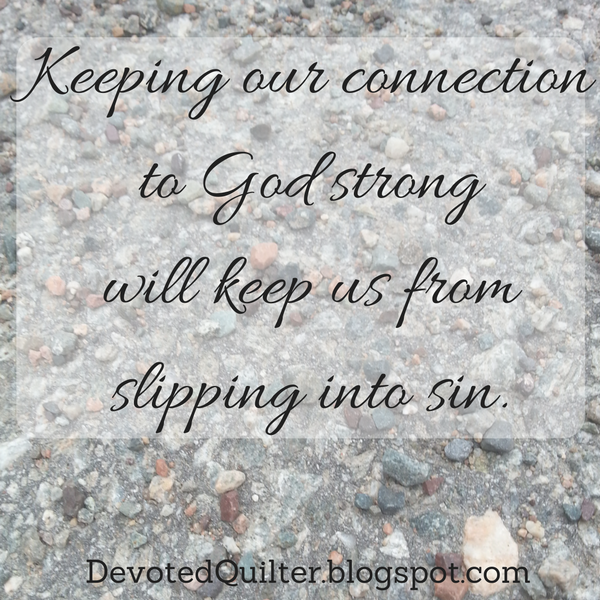 Keeping that connection strong will keep us from slipping into sin. Many thanks to Anja at Anja Quilts for sharing the link to the sew-a-long at Quilt Barn, which has a lot of helpful pictures and tips. The pattern by Sew Demented (affiliate link) is clear and well written, but the sew-a-long has extra pictures and that always makes sewing easier. Some of the seams in the final construction of the bag are really bulky, and I'm no expert with zippers, so the bag is far from perfect, but I'm still really pleased with it. This is the bag I used to use for my EPP projects. I made it back in 2013, shortly after starting this blog, for my very first blog hop, and it has served me well. There were times, though, when I was frustrated by needing to dig to the bottom of the bag to find something. Obviously, that won't be a problem with the new bag. 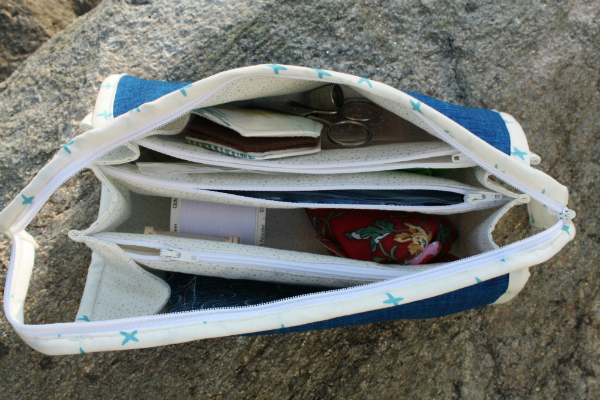 Just look at all those pockets and compartments! 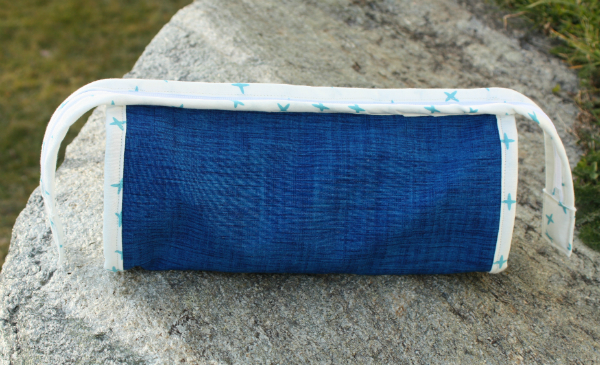 I had planned to make the pockets out of different scraps of blue, but all the pieces I pulled were too small and I was sewing at a friend's house, so I couldn't just go raid my stash again. 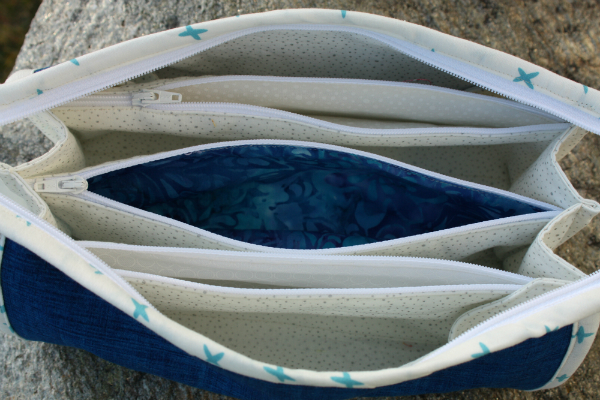 The lining is all one fabric, the middle pocket is a fabulous blue batik and the other two pockets are different whites. In the end, I actually really like having only one blue pocket because it stands out so much. Here is the bag full of my EPP supplies. As you can see, there is lots of room and I won't have to be digging around to find anything. 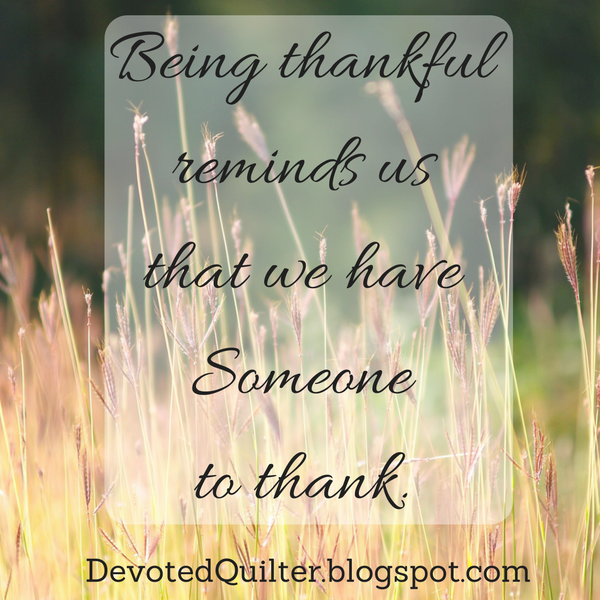 In other news, Devoted Quilter is finally on facebook! I know, it took me long enough, right? The problem is, I don't really know what I'm doing over there, so if there is a group I should join, let me know in the comments. 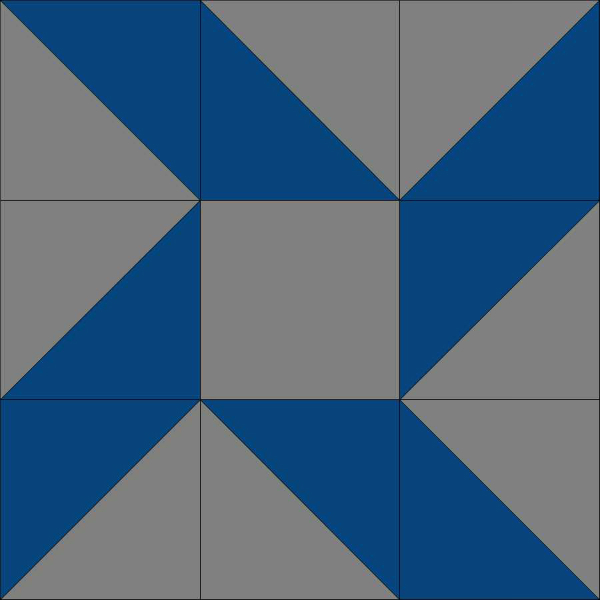 So far I've joined the Quilt Design a Day group, which is one of the reasons I wanted to join facebook to begin with, but I know there are more groups I should check out. 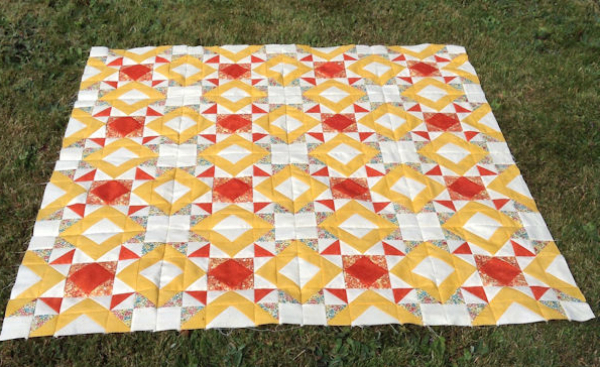 I really want to be able to connect with other quilters, but I find it a little overwhelming, to be honest, so please point me in the right direction! Thanks! Now I'm off to go searching through my scraps to find more fabric to use for my EPP. There's lots of room in my bag, after all! I'll be linking up this week with Let's Bee Social, NTT, TGIFF, Can I Get a Whoop Whoop and Finish it up Friday. * This post contains an affiliate link. That means that if you click the link and then make a purchase, I may receive a small commission, but it does not affect the price you pay. It's Thanksgiving weekend here in Canada and as I was thinking about what to write for this devotion this week, everything I thought about was actually what I wrote in my Thanksgiving devotion for last year. Since that is still exactly how I feel about the importance and the purpose of giving thanks to God, I am sharing that message again today. So tell me, what are you thankful for? Big or small, share it in the comments below! Finally! Finally, I can share this quilt with you! I have had it finished since June and it has been on our bed all summer, making me happy every time I walked past our door, but I haven't been able to show it to you. But now I can! This is Love Birds, and it is in the latest issue of Make Modern magazine (affiliate link), which was just released today. From now until December 1st, you can get this issue for $6 AUD with the coupon code issue13friends. 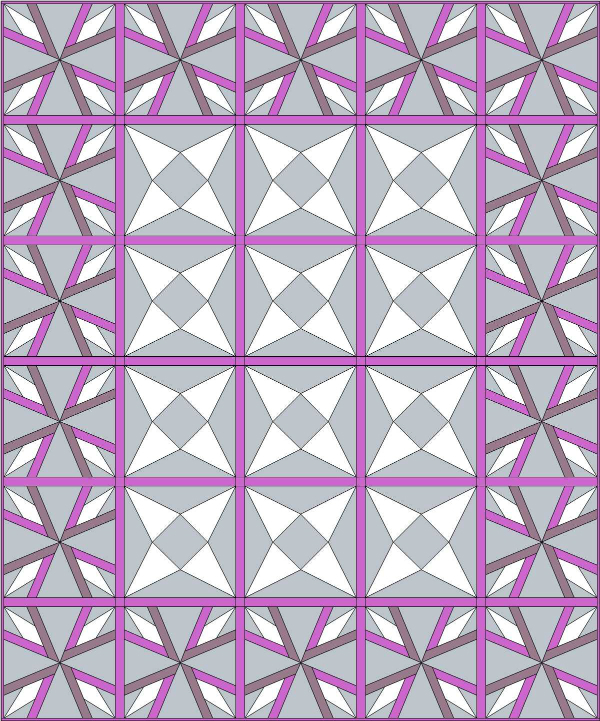 Believe it or not, this quilt is based on this block, which EQ7 calls 'Eccentric Star 3'. 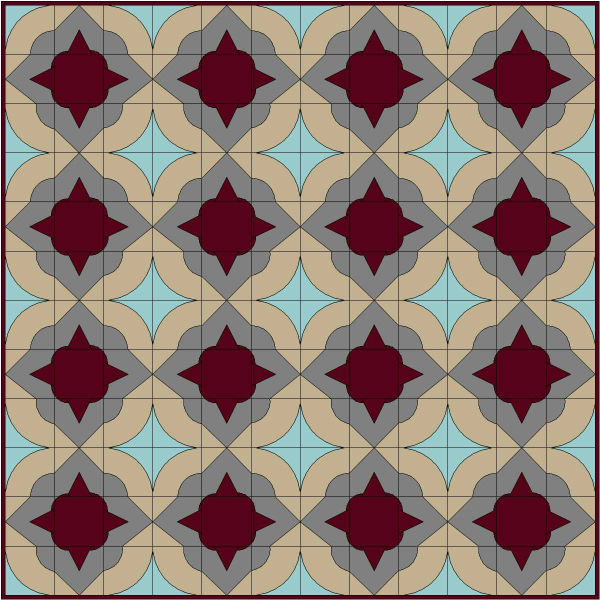 When I put the block into a quilt layout in EQ7, I decided to rotate every other block, which made me think of two birds kissing where the v's meet. The more I looked at the design, the more I liked it. I've been wanting to make a quilt for our bed for years, but I could never settle on a pattern I liked enough until I saw this. 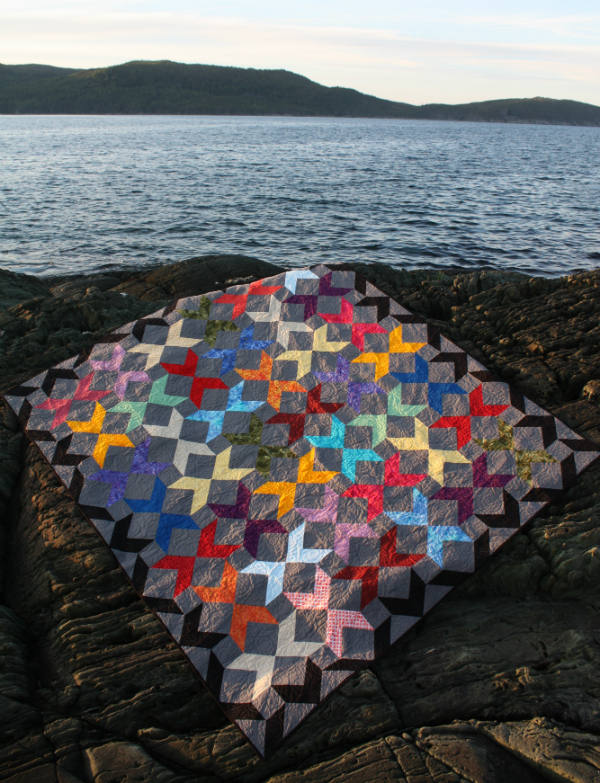 As you can see from the block, the whole 84" x 96" quilt is made entirely of squares and HSTs. Lots of HSTs. I found they came together faster than I expected, though, probably because I made them in batches, sewing, trimming and pressing each batch before starting again with a new batch. It felt like I was making progress faster that way than if I had tried to sew all of them at once, then trim them all, etc. I knew I didn't want to quilt this one densely, both because of the time that would take and because I wanted the quilt to stay nice and soft since it would be going on our bed. I chose this looping spiral design after seeing it on IG and I love how it looks. I tried really, really hard to quilt the looping spirals bigger than my normal small quilting. It was tough, as all those empty spaces seemed to be calling out, "Quilt me, quilt me!" but I resisted and the quilt is lovely soft and drapes so nicely. I did find it challenging to quilt on a larger scale though, and for the first time I found myself wishing for a machine with a larger throat space. It wasn't because I wanted to fit more quilt in there, but because I wanted more room to move my hands as I tried making those big circles! I really wanted to get good pictures of this quilt, so I took it on a little hike shortly before sunset, to take advantage of golden hour. It actually took two nights, since the first night I couldn't find a setting I liked. The second night went better, mostly thanks to my friend Michelle who came along that night and had some great ideas. 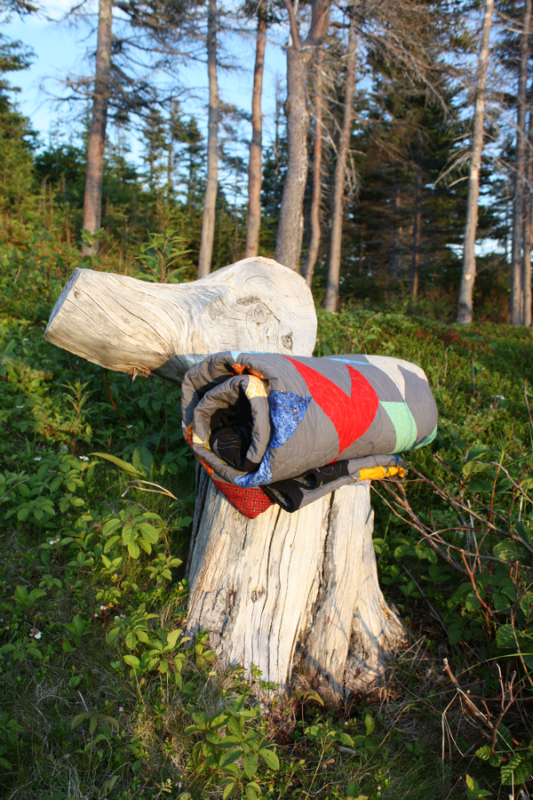 And we found this stump, which makes a great spot for a quilt roll picture, don't you think? 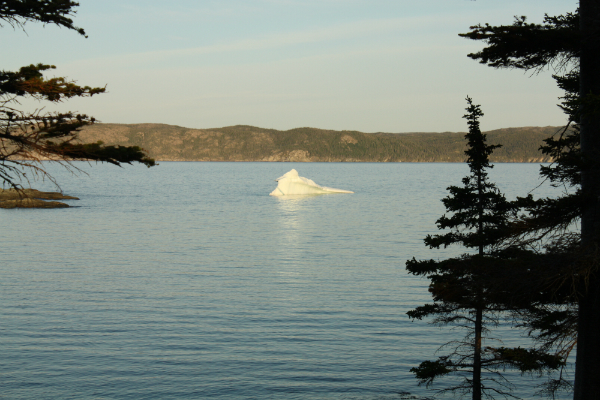 There were a couple of tiny iceburgs in the area when we were taking the pictures (early July). 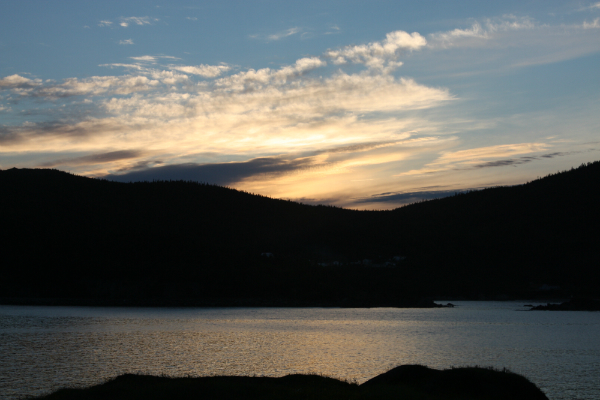 And this is how it looked just after the sun disappeared behind the hills. Here's one more picture, just because I love it! 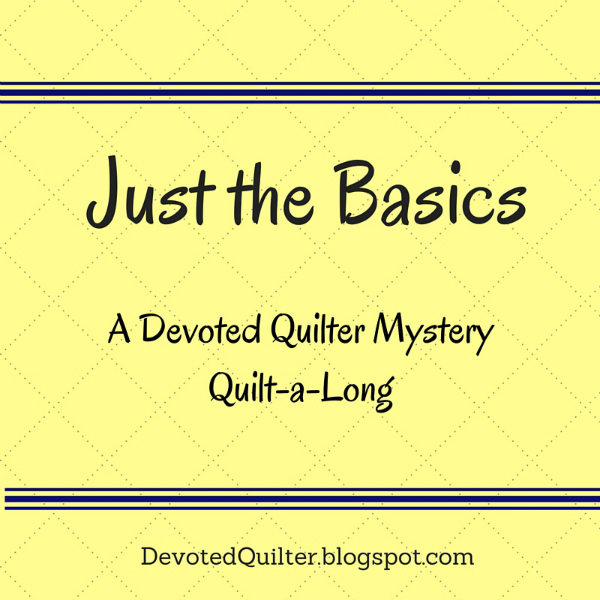 It's time to celebrate the wonderful finishes of the people who were sewing along with me for the Just the Basics mystery quilt-a-long! First up, we have Shannon, who blogs at The Fleming's Nine. I love the black text print she used, which has the names of God printed in beautiful script. 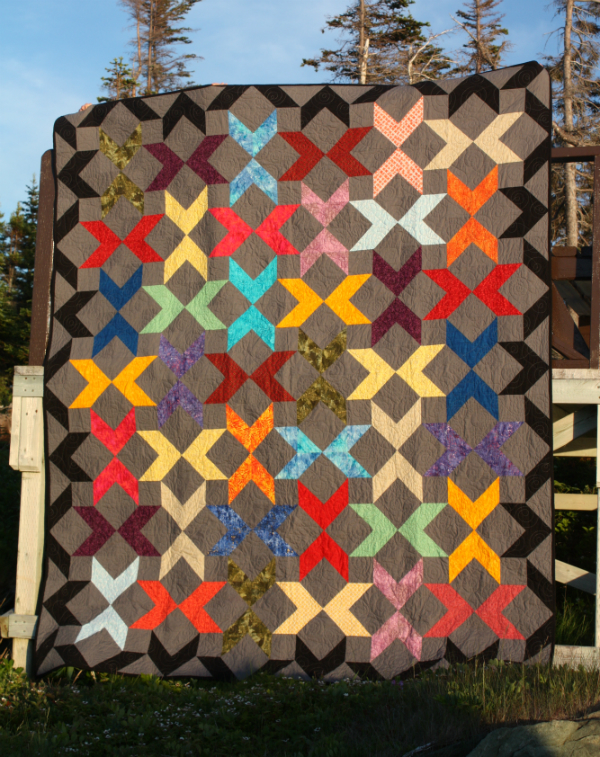 You can read all about her quilt in her finish post. Next up is Anja, who blogs at Anja Quilts. Isn't it interesting how a busier background changes the look of the whole quilt? I like how it seems to soften the design somehow. You can visit Anja's post from when she finished her top here. And then we have Kathy, of Both Sides of the Pond. Kathy hasn't quilted hers yet, but the top is gorgeous, don't you think? I love how the yellow boxes are so dominant in Kathy's version. You can see more pictures of her finished top in this post. 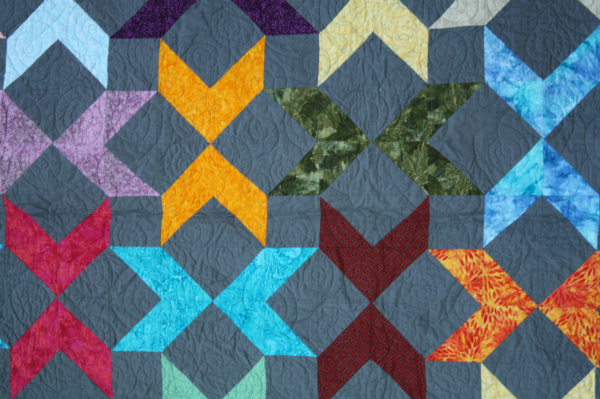 Did you notice whose finished quilt isn't shared in this finish parade? That's right, it's mine! Why, you ask? Ummm...because it's not finished :( How embarrassing to not have a finish for my own finish parade! I decided to custom quilt mine very heavily, which is taking longer than I expected, plus I've had some neck issues the last few weeks that have been keeping me from quilting as much as I want to. So, all put together, I'm a bit behind, but I hope to have my own finish to share soon. 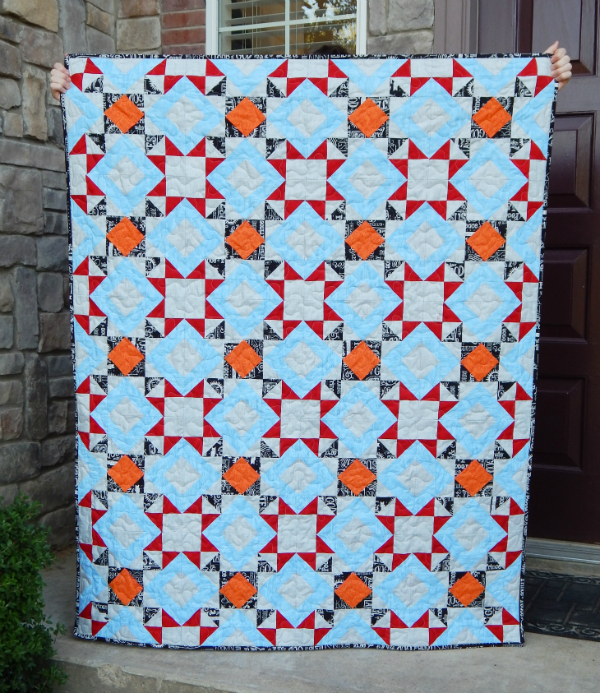 I so want to thank those who were quilting along with me for my first quilt-a-long. It was so fun to see your progress each month and know I wasn't just talking to myself as I posted each set of instructions! If you're inspired by these beautiful versions to make your own Just the Basics quilt, it's not too late. The instructions can all be found under the Just the Basics tab at the top of the blog. I'd love to see your version too! Did you ever say that as a kid? I know I did, many, many times. But isn't it the stupidest of all stupid sayings? We all know that sticks and stones can hurt, yes, but we should all know words can hurt just as much, no matter how hard we try to strip them of their power. People the world over are living with the scars left by harsh, demeaning and dehumanizing words spoken against them. We've all been hurt by someone else's careless comment that left us feeling somehow "less" than we had been a moment before. And, if we are honest, we've probably been the one to speak those careless words at times too. The power of words is nothing new, of course. David wrote in Psalm 64, "Hide me from the conspiracy of the wicked, from the plots of evildoers. They sharpen their tongues like swords and aim cruel words like deadly arrows. They shoot from ambush at the innocent; they shoot suddenly, without fear" (vv. 2-4). Isn't it appropriate that David compared words to weapons? Just think about how a mean comment can make it hard for you to even breathe...how a dream can be crushed if someone you trust tells you it's a waste of time...how a child's whole day can be ruined if a friend says they won't ever play together again (even if we grown ups know the friend will have a change of heart by morning). Though we're (hopefully) not intentionally using our words as weapons, the potential for damage is just as high when we're only being careless. After all, a gun shot accidentally still has the power to hurt someone. And perhaps the potential for damage is even higher with our careless words, because we sometimes don't realize we've said something hurtful and so we repeat it over and over again. Proverbs 18:21 says, "The tongue has the power of life and death." Just think about that for a moment; think about the power that our words have. When we speak, we have the power to positively build someone up, to lighten their load, or to let them know they're not alone. Or we have the power to drag them down, increase their burden or make them feel isolated and abandoned. Now think about how often we speak without thinking. Scary thought, right? 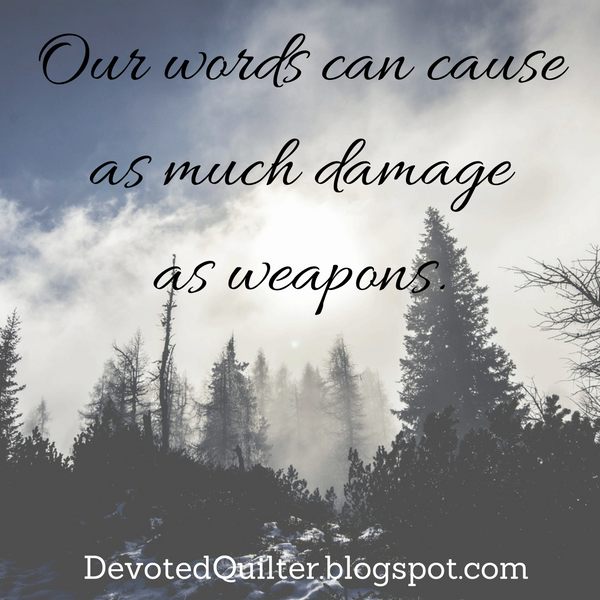 If our words have the potential to cause as much damage as weapons, then we had better be aware of what we're saying. We had better slow down and think before we speak. We had better be sure that what we say will be full of the power of life and not the power of death.